Many of us think that in order to experience the “Great Outdoors” we have to load-up the wagon and head for the hills. It is always a pleasant surprise to find a bit of paradise in our own little comer of the planet. Such is the case with the John Gagnon / White Birch trail to the top of Kissacook Hill. The U.S. Geological Survey’s topographic map of Westford (1978) shows the top of Kissacook Hill to be at an elevation of slightly over 416 feet, or just about that of the 2nd floor of Town Hall. And while 416 feet is by no means K2, it does qualify as the 3rd highest point in town. Elevation aside, it is Kissacook’s small-town charm and visible history that makes it worth the trip. There are many interesting sites along the trail as one ascends the hill. Of particular note are the old quarry sites that lie right beside the trail. Be advised that these quarries are of the “Mom & Pop” variety rather than the H. E. Fletcher Granite Co. breed and it is totally possible to walk right past them if you are not on the look-out. In studying them, one has to wonder if the harvesting of the granite was some sort of cottage industry or simply the means of gaining the necessary stock for a set of steps or a sturdy hearth. Whatever the reason for their existence, one cannot help thinking of the old Yankees that split these stones so long ago. At the top of the hill is an old outdoor classroom consisting of several benches set in a huge stand of white birch trees. There is another such classroom closer to the beginning of the trail, but the one at the top is in better condition and is a great spot for lunch. From here the trail runs fairly level to the south for a distance before turning east and back down the hill. 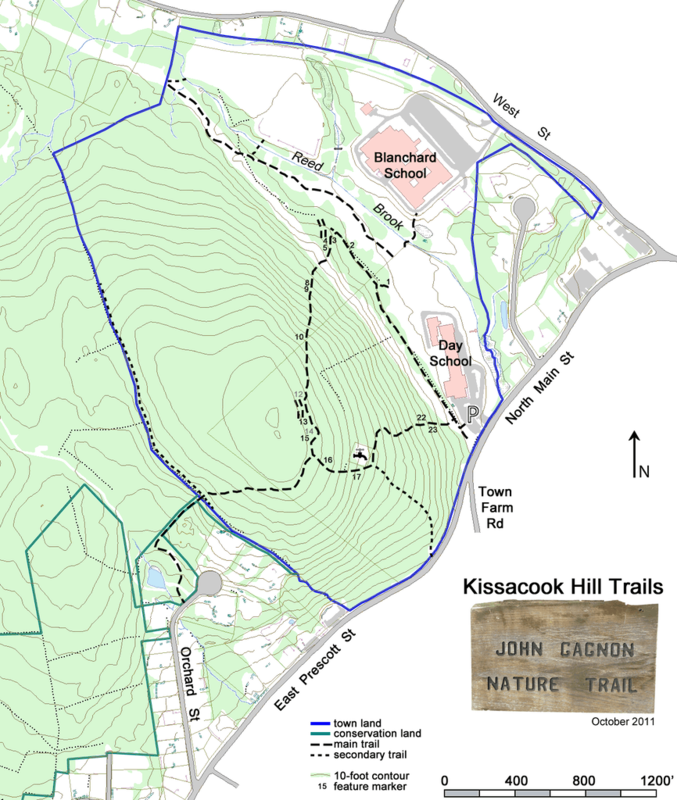 In this area another trail leads off to the right (west) and extends down the other side of Kissacook Hill to Orchard Street in Forge Village, which may be explored at your leisure. Following the main trail will take you in short order to a large water tower where the trail can be picked-up again between two small boulders near the tank and east of its access road. From here the going is a bit steep and some caution is advised especially if hiking with small children. The trail winds its way down the hill and ends in the front parking lot of the Day School. In total, the walk is slightly under a mile long and well worth the minimal effort required. Wildflowers grow along the entire length of the trail and there is a fair amount of birdlife to be seen including an occasional hawk. And, as the White Birch Trail’s name implies, this short hike would be a spectacular sight in the autumn. The best way to access the trail is by parking in the rear of the Norman E. Day School and locating the trail-head about 150 yards to the right of the bluebird boxes along the scrub brush. The trail is wide and easy to follow once it is located.